China is banning all ivory trade by the end of 2017, but business is booming in neighbouring countries. Investigators visited a Chinese casino resort on the Mekong River. They described a hub of gambling and prostitution, where ivory sales are booming among Chinese visitors who make up more than 80% of sales. The researchers found dozens of shops selling thousands of items – carved tusks, ivory bangles, pendants and bracelets – openly for sale. Like Vietnam and Myanmar, the prices are cheaper in Laos than on the Chinese mainland, and law and order is lacking – the report authors say – meaning the illegal cross-border trade is not policed. “In the absence of effective law enforcement, the sales of ivory items to Chinese consumers will continue to rise,” said researcher Esmond Martin. Tens of thousands of African elephants are killed every year for their tusks, and Chinese buyers are getting around a domestic ivory ban on the mainland by shopping in neighbouring countries. International criminal syndicates are involved in ivory trafficking, which encourages, and is encouraged by, corruption across Africa. The founder of Save the Elephants, Iain Douglas-Hamilton, says China’s decision to ban the domestic trade in ivory by the end of this year, and increased anti-ivory sentiment, has been hugely significant. “But it’s not a panacea – it has to be reinforced now by bans in the peripheral countries, where those who still want to buy and trade ivory have nipped across the border and set up shop in neighbouring countries,” he said. 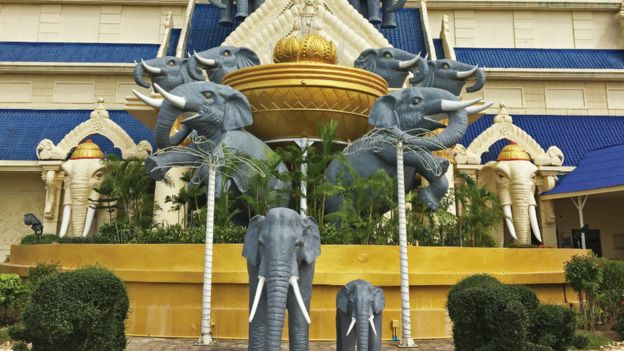 Save The Elephants said the growing retail market in Laos is the latest threat to African elephants. The report’s lead author, Lucy Vigne, said Laos urgently needs to take steps to tackle this growing problem. “With a lack of strong and continuing international pressure to curtail the trade in ivory in Laos and a lack of interest by the Laotian government, there has been a significant and relatively sudden growth in the ivory trade,” she said.